Abstract: Part of the CCIE Professional Development series, "Troubleshooting IP Routing Protocols" is an 850 page CiscoPress guide book for networking engineers. 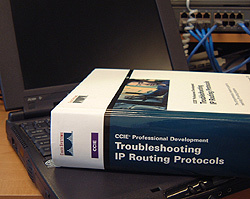 Part of the CCIE Professional Development Series, "Troubleshooting IP Routing Protocols" is an 850 page CiscoPress guide book for networking engineers who need to acquire expert-level skills at a moment's notice. Packed with many years of experience of working solutions used to resolve the most common routing problems related to a variety of routing protocols the book also serves as expert-level instruction for networking professionals preparing for their CCIE exams. With a focus on IPv4 addressing which is the type of IP address in use currently, the book sidesteps IPv6, but leaves valuable problem solving insight which will help in the future when that protocol is fully implemented. The book begins with a short overview of different IP routing protocols as a refresher and the jumps right into a dissection of Routing Information Protocol (RIP), and a fairly extensive chapter on troubleshooting it. Cisco's book continues on with chapters on IGRP, EIGRP, OSPF, IS-IS, PIM, and BGP-4 with subsequent troubleshooting sections which offer anywhere between 15 and 30 examples laided out in a step by step pattern. The troubleshooting examples, and indeed the protocols are fairly advanced networking subjects with a specific focus on Cisco IOS Software network devices. Typical problem examples are broken down into sections to offer admins the easiest, and quickest way to problem solve. Advanced users familiar with the basics of a problem can quickly glance at a short point form list of possible solutions to the problem at hand. Based on the quick list of possible causes they can resolve the issue on their own or continue on with detailed explanations of each particular cause and effect. Within those explanations the authors of the book have set up several tools to help with visualizing the problem, and then resolving it. Included with each problem or case study is a problem-resolution flowchart, network set up diagram and then command line examples of process. The information is specific to each of the outlined points at the start of the chapter, and frankly, most of is out of my sphere of expertise. That said, I do think the focus of the book has been well positioned, and the problem identification and resolution well written. It may take some adaptation to remove the holistic information from the Cisco-only applications, but the foundation for universal problem resolution is definitely there. Unlike some of the other Cisco Press books we have looked at in the past, the explanations and discussion in IP routing Protocols is very specific and much better explained. For individuals engrossed in this kind of troubleshooting on a day to day basis, the book offers a wealth of valuable insight and information. For advanced users getting ready to take Cisco's CCIE exams, this book can be a very useful tool. 2. Understanding the Routing Information Protocol (RIP). 4. Understanding the Interior Gateway Routing Protocol (IGRP). 6. Understanding the Enhanced Interior Gateway Routing Protocol (EIGRP). 8. Understanding the Open Shortest Path First (OSPF) Protocol Troubleshooting OSPF. 9. Understanding the Intermediate System-to-Intermediate System (IS-IS) Protocol. 11. Understanding Protocol Independent Multicast (PIM). 13. Understanding the Border Gateway Protocol Version 4 (BGP-4).